No need to waste your time in designing an OMR sheet or learning how to do it Verificare OMR software will do it on your behalf without creating any hassle for you. OMR Home has provided a free sample of 40 questions OMR sheet, to download. Mostly used by educational institutions, it is used to attempt offline exams that are objective or multiple choice type in nature. 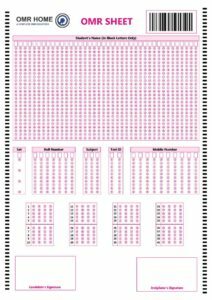 The sample OMR sheet consists of total 40 questions, divided in 4 rows with 10 questions in each row. Every row has got 5 sets and every question has got 4 options named A,B,C,D. The students are instructed to fill relevant bubbles and not to put cross or tick marks in them. Previous Post:Which type of OMR Sheets can be read by OMR Software? Next Post:Which is the best scanner that can be used with OMR Software?